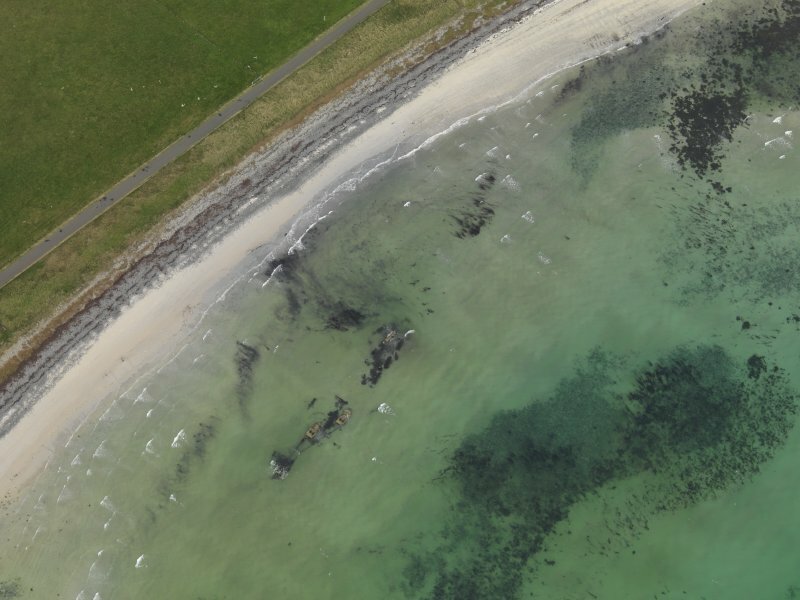 Oblique aerial view centred on the remains of the German destroyer, taken from the SW.
Sanday [name centred HY 67 40]. (Location cited as HY 7462 4414). The German Destroyer B98 was driven ashore in 1919 while under tow to Scapa Flow. The base plates of the hull survive with boilers and turbine casings in situ. Information from Dr R G Lamb (Orkney Islands Archaeologist), visited 1979. The Destroyer B98 arrived at Scapa Flow with mail for the interned German fleet on 21 June 1919 - just after fleet had been scuttled. 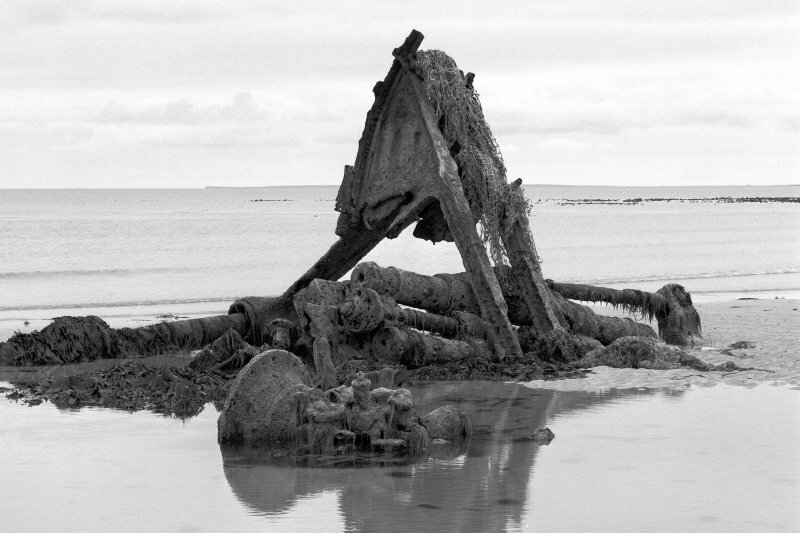 She was seized by an armed boarding party and was later wrecked on Sanday. 23 May 1920. The wreck is shown at 59 16 46N, 002 26 50W on a tracing supplied by the Commanding Officer, North of Scotland area, 31 March 1920. 7 August 1986. 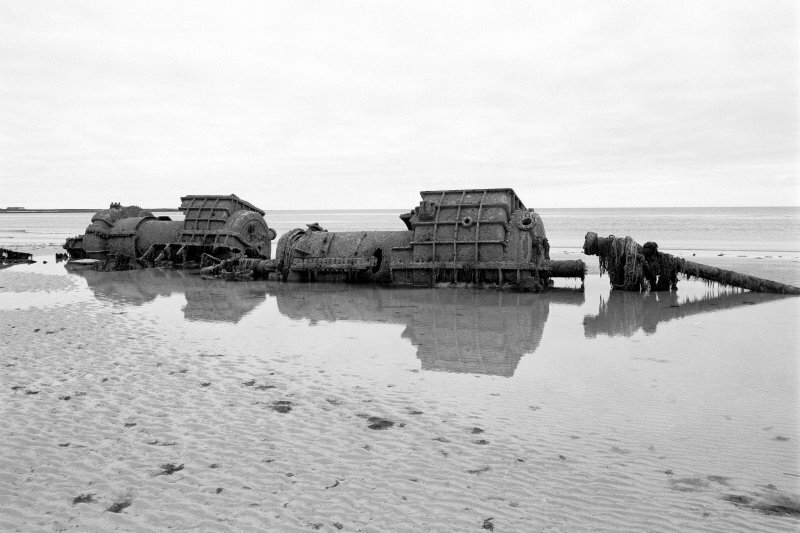 The remains of the engine were found close to the shoreline. A search 200-300 metres underwater to seaward failed to locate any further wreckage. Report by B Winfield, 26 July 1986. 19 August 1987. It is confirmed that the engine wreckage is visible at low water. Report by B Winfield, 4 August 1987. Laying in the bay nearby this point, the remains of a ship can be seen. This is a German Destroyer B98 from World War I. The German Fleet was interned in Scapa Flow at the end of the First World War and on 21 June 1919, orders were given by the German High Command to scuttle the whole fleet. Some remnants of the fleet were shared amongst the allies, one of these being the B98, which had operated as a mailboat. As it was being towed away, the B98 broke her tow and went aground in the Bay of Lopness. 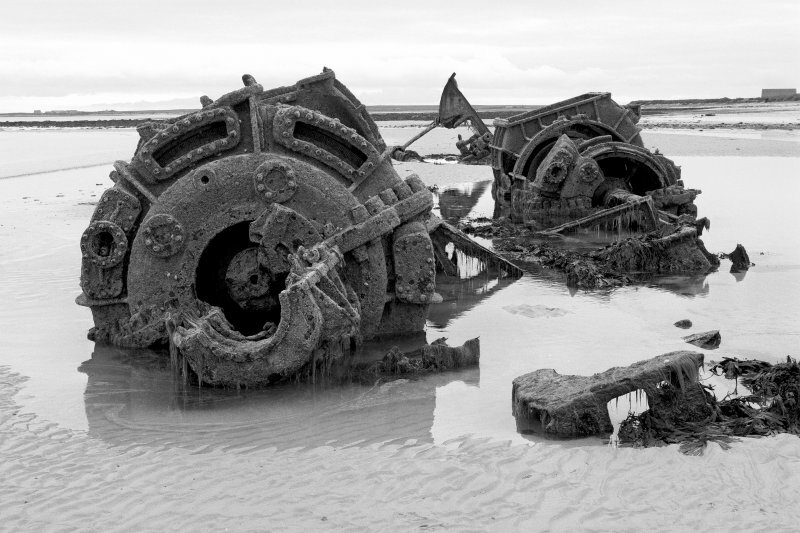 Much of the wreck was cut up for scrap in the 1940's and one of its guns is now on display at the Maritime Museum in Lyness, Orkney. Visited by RCAHMS (GJD) 12 August 1996. (Classified as destroyer: date of loss cited as 17 February 1920). [SMS] B98: this vessel was scuttled at Scapa, refloated, broke from tow, and stranded. Registration: German. 1843 tons displacement. Length: 97m. Beam: 9m. (Location of loss cited as N59 16.77 W2 26.83). This ship was one of two units of the B97 class both being built at Hamburg by Blohm and Voss. She was completed in 1915 and apparently saw little (if any) war service before becoming a supply and despatch vessel for the interned High Seas Fleet. On arrival in Scapa Flow with mail on 21 June 1919, the ship was seized by British forces by way of reparation for the scuttle. 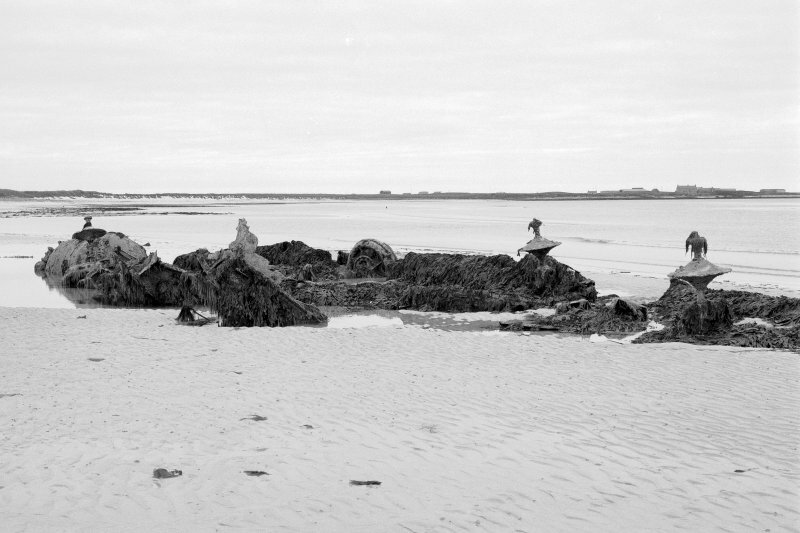 Whittaker notes the ship as having been scuttled at Scapa and refloated, subsequently breaking from her two and being stranded on 17 February 1920. The location 2 miles E of Start Point that is cited by Larn and Larn presumably refers to the loss of the tow. The location cited falls near rocks within the N side of the Bay of Lopness, an extensive area of shallow water which is open to the E, SE and S.
Information from RCAHMS (RJCM), 15 October 2002. H M Le Fleming 1961; D Van der Vat 1986; R and B Larn 1998; I G Whittaker 1998; [Jane] 2001. HO Chart no. 1954 (1982, revised 1993). 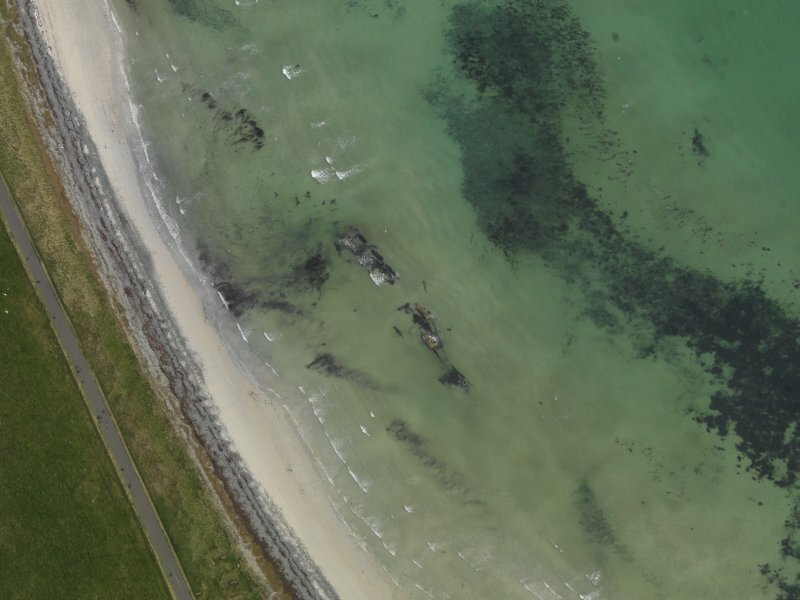 The German destroyer, B98, became beached in the Bay of Lopness while on tow to Scapa Flow for salvage in 1919. The superstructure has now been largely removed and the hulk rests in shallow water some 20m from the foreshore, with framework, turbines and boilers exposed. Ref. : RCAHMS (1980) #221. Project Adair - UKHO data upload. Circumstances of Loss : **ARRIVED AT SCAPA FLOW WITH MAIL FOR INTERNED GERMAN FLEET ON 21.6.19, IMMEDIATELY AFTER FLEET HAD BEEN SCUTTLED. WAS SEIZED BY ARMED BOARDING PARTY. WAS LATER WRECKED ON SANDAY AFTER BREAKING ADRIFT WHILST UNDER TOW. BUILT WITH 2 X SCREW, STEAM TURBINES. (SIBI). Surveying Details : **H1369/20 23.5.20 SHOWN IN 591646N, 022650W ON TRACING SUPPLIED. 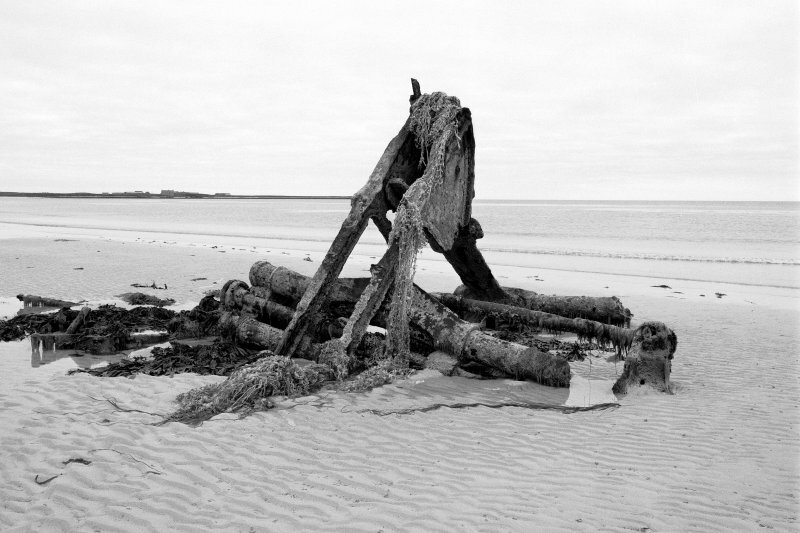 (CO NORTH OF SCOTLAND AREA, 31.3.20). INS AS WK (OLD SYMBOL). BR STD. **H3875/26 18.6.26 AMEND TO ST. BR STD. 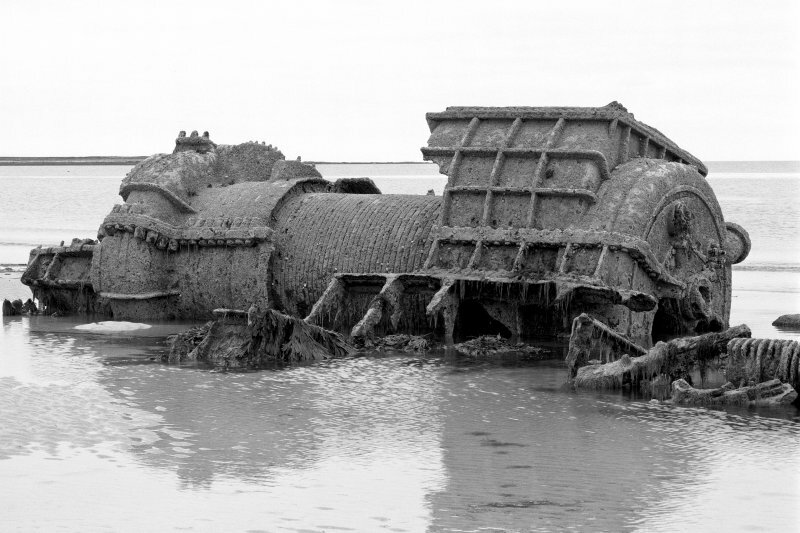 **H1310/86/20 7.8.86 REMAINS OF ENGINE FOUND CLOSE TO THE SHORELINE. A SEARCH 200-300MTRS UNDERWATER TO SEAWARD FAILED TO LOCATE ANY FURTHER WRECKAGE. (B WINFIELD, 26.7.86). **H1310/86/20 19.8.87 CONFIRMED THAT ENGINE WRECKAGE IS VISIBLE AT LW. (B WINFIELD, 4.8.87). NCA. **HH091/137/01 & SEP 2009/000188812 6.12.09 LOCATED 24.5.06 IN 5916.957N, 0226.877W [WGD] USING HAND-HELD GPS. LENGTH 83MTRS. (NETSURVEY, HI 1137). MACHINERY REMAINS ONLY. RETAIN ST IN REVISED POSN. BR STD. Project Adair - ORCA data upload. Note : Location updated in 2009 using hand held GPS with an accuracy of plus or minus five metres. 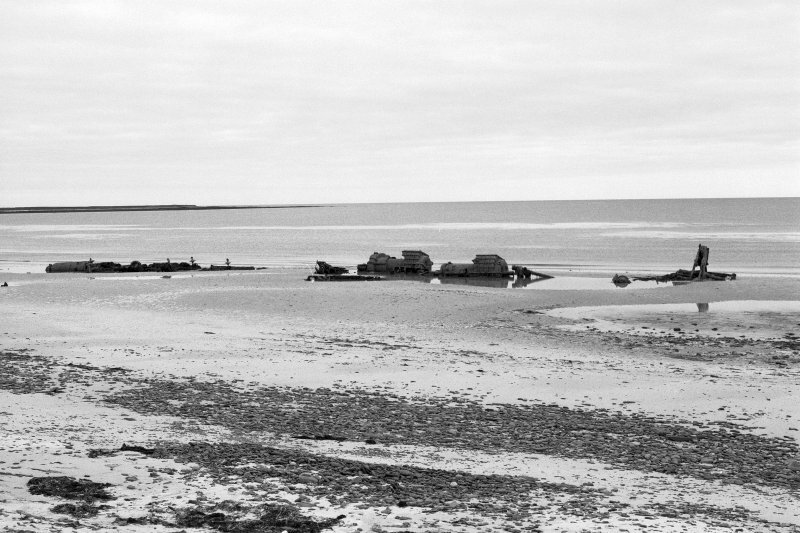 The wreck is only clear of the sea on the beach at the lowest of tides. It is ordinarily submerged partially or completely.